WHATEVER HAPPENED TO THAT OTHER MOVIE-THEMED COMIC? I’ve been getting a lot of e-mails recently asking me what’s going on with Brian Carroll and his excellent comic Instant Classic. If you’ve tried to access the site the last couple of days, you’ve noticed it isn’t there and is actually pointing you to another site completely. Since Brian and I are pals (and since it’s kind of pointless to answer the same questions through e-mail over and over), I thought I would take the initiative to explain the situation here to the fans who read BOTH Instant Classic and Theater Hopper. Basically, Brian’s web hosting server has been screwed ever since that myDoom virus struck a little while ago. The hosting provider has been working to install new security measures and in the meantime, has disabled the server on which Instant Classic resides. Brian is basically at the mercy of his hosting provider until he gets his ducks in a row. You might be asking yourself “Why doesn’t Brian switch hosting providers?” Well, let’s put it this way. Brian, like many hard-working college students is a bit strapped for cash. His current set up isn’t costing him a dime, so it’s difficult for him to gather the monetary resources to stake a claim with someone else. Brian’s hinted at offering advertising through the site to cover costs, but I think he’s waiting to see how the current situation pans out. That’s pretty much all I know at the moment. I hope this helps everyone who’s been freaking out over Brian’s absence. Believe me, I’m in the same boat with you! Hopefully we’ll catch up with Kate and Author soon! Brian Carroll of Instant Classic and BriWorld fame has a new web comic side project for you to check out. It’s called Trumpet Airlines and it probably has one of the more fun web site designs on the scene right now. Check it out! Something I think everyone needs to know about is that Brian Carroll has returned to his web comic roots with a brand new Instant Classic story. It’s called “Brothers Donathan” and it takes place one year after the events of the Prologue and about four years before the events to take place in the “Union Forever” storyline Carroll has yet to share with us. Brian’s been kind of having a rough time of things lately, so it’s good to see him pouring his energy into his art. I’ve always enjoyed his style and know for a fact he can run circles around the majority of web comic writers out there when it comes to plot and characterization. All you have to do is look at the home page of the Instant Classic web site to know that Brian has some pretty lofty, long-term ambitions. There is a story with a far-reaching scope just waiting to be told. You can tell he’s thought it all out. I wish I could plan that well in advance. Anyway, welcome back, Brian Carroll. The movie-themed web comic genre is a little less lonesome with you in it. Two things that I couldn’t fit contextually with the giant blog post that preceded it, but I have more I need to talk about. First, don’t forget to check out the podcast I host with Gordon McAlpin from Multiplex and Joe Dunn from Joe Loves Crappy Movies called The Triple Feature tonight at 9:00 PM over at TalkShoe.com. For SURE we will be talking about Monsters vs. Aliens because I know this is one of the rare movies that all three of us have seen before recording the show. So you know we’re going to firing on all cylinders tonight! We also gotten in the habit of reading listener questions on-air. We have a bunch of good questions for this week show and I’m really looking forward to answering them. If you’d like to have your question answered (it can be about movies, comics, whatever!) sent it to group@thetriplefeature.com. We WILL answer it! 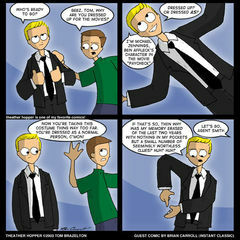 The next thing I need to do is point your attention to another movie-themed web comic, Brian Carroll’s Instant Classic. Specifically, his latest strip, titled “The Last Seven Hours.” This comic is nothing short of brilliant. It’s basically a musical number in web comic form. 44 panels in length, plotted and written within an inch of it’s life, the comic is accompanied by a piano number written by Carroll and performed by three of his friends and the song is excellent. I’ve known Brian for a few years. Our comics kind of came up around the same time. Stuff like this is where he really shines. It is unique, endearing and puts me to shame as a fellow artist. I’ve always felt Brian’s efforts were the classier affair between our two comics. If Theater Hopper were Milk Duds, Instant Classic would be a chocolate covered truffle. You owe it to yourself to check it out. Tell ‘im Milk Dud sentcha! Mar 5, 2007 DON’T FORGET THE TRIPLE FEATURE TONIGHT! Oct 1, 2007 MY CONTESTS ARE GREAT!